Wow! Those stories are so awesome. It just shows that hugs are very special in many different ways to so many people. 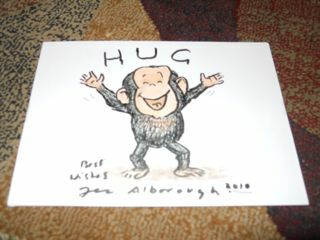 I was so overwhelmed with the response that I am giving away 3 copies of the book HUG by Jez Alborough in addition to the drawing he generously provided! The winner of the drawing from Jez Alborough of Bobo was Craig. The winner of the books were Michelle, Amaprincess, and Marty. I also enjoyed reading all the hug stories. I forgot to comment with mine. My family always gave hugs to each other growing up but we didn't really show that kind of affection to those outside our immediate family. When I went to my husband's family reunion the first time, everyone gave hugs. It was a hug-fest. I wasn't sure what to think at first but it kind of grows on you and now I'm all about the hugs. Congrats to all the winners and so glad you got such a great response!